Dutton Laboratories has released an all-McCabe chamber music CD on Epoch CDLX 7125. 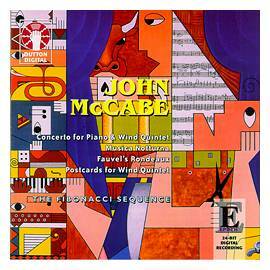 Starring the well-known chamber ensemble, The Fibonacci Sequence, the CD represents music from all stages of McCabe's career, from his 1964 Musica Notturna for Violin, Viola and Piano, through to the 1995/6 work, Fauvel's Rondeaux, which is a 'satellite' work of his ballet (Stuttgart Ballet/David Bintley). The other works on the CD are his frequently performed Concerto for Piano and Wind Quintet (1969), and Postcards for Wind Quintet, a reworking of his Eight Bagatelles for two clarinets, written in 1965. Dutton Laboratories, headed by Mike Dutton, made its name with the specialist remastering for CD of heritage recordings. The enterprising Epoch label, however, has branched out as an English music series, and other new releases include CDs of York Bowen, Coleridge-Taylor, and William Hurlstone.